Warner Britton was born on April 1, 1925, in Liberal, Kansas. He enlisted in the U.S. Army Air Forces on March 1, 1943, and entered the Aviation Cadet Program on April 27, 1943. Britton was commissioned a 2d Lt and awarded his pilot wings on June 27, 1944, and was trained as an OA-10 Catalina pilot. He flew 81 combat missions in the Southwest Pacific area with the 2nd Emergency Rescue Squadron between October 1944 and August 1945. Lt Britton left active duty and joined the Air Force Reserve flying C-47 Dakota transports from January 2, 1946 to March 7, 1950. After returning to active duty, Capt Britton served with the 28th Strategic Reconnaissance Wing at Rapid City AFB (renamed Ellsworth AFB in June 1953), South Dakota, until August 1953, when he began Helicopter pilot training. Britton then served with the 66th Air Rescue Squadron in England for two months before being assigned to the 81st and then the 83rd Air Rescue Squadron, flying the SH-19 in West Germany, where he served from January 1954 to November 1956. He then attended H-21 helicopter training and was assigned to Bolling AFB, Washington D.C., until April 1958. Britton then transferred to the 46th Air Rescue Squadron at Otis AFB, Massachusetts, where he served from April 1958 to October 1959. He served with the 55th Air Rescue Squadron at Thule AB, Greenland, from October 1959 to October 1960, and then with the 4900th Air Base Group at Kirtland AFB, New Mexico, from October 1960 to September 1962. Maj Britton then attended Air Command and Staff College at Maxwell AFB, Alabama, from September 1962 to June 1963, and then stayed on as a faculty member of the college until September 1966. Col Britton next served as Commander of Detachment 5 of the 38th Aerospace Rescue and Recovery Squadron (ARRS) at Udorn Royal Thai AFB, Thailand, from December 1966 to September 1967, and then as Commander of Detachment 1 of the 37th ARRS at Nakhon Phanom Royal Thai AFB, Thailand, from September 1967 to January 1968. He then served as Chief of Flying Training with the 48th ARRS at Eglin AFB, Florida, from January 1968 to August 1971. During this time, Col Britton participated in the Son Tay Raid of November 21, 1970. 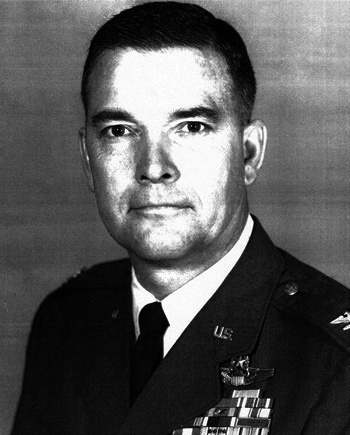 He became Deputy Commander of the 3rd Aerospace Rescue and Recovery Group at Tan Son Nhut AB in the Republic of Vietnam in August 1971, and served in this position until becoming the Special Assistant to the Commander of the 41st Aerospace Rescue and Recovery Wing at Hickam AFB, Hawaii, in January 1972. Col Britton's final assignment was as a Staff Officer at Headquarters Aerospace Rescue and Recovery Service at Scott AFB, Illinois, from March 1972 until his retirement from the Air Force on July 31, 1973. Warner Britton died on June 10, 2005. The President of the United States of America, authorized by Section 8742, Title 10, United States Code, awards the Air Force Cross to Lieutenant Colonel Warner A. Britton for extraordinary heroism in military operations against an armed enemy of the United States as the Helicopter Flight Leader during the Prisoner of War search and rescue operation at Son Tay, North Vietnam, on 21 November 1970. On that date, Colonel Britton led a flight of troop-carrying helicopters on a night mission into an extremely hostile environment in the heart of North Vietnam. Although initial conditions following off-loading of troops in the objective area were considerably different than planned, he correctly assessed the new circumstances and at risk of life under direct close range ground fire, again landed, picked up a load of troops, and moved them to a new location. His final departure from the objective area was through an intense array of surface-to-air missiles which he evaded with calm, exceptional flying skill. Colonel Britton, without regard for his personal safety, contributed immeasurably to the tactical success of the rescue attempt. Through his extraordinary heroism, superb airmanship, and aggressiveness in the face of the enemy, Colonel Britton reflected the highest credit upon himself and the United States Air Force.